We made it. For now – I just need to recover! More soon. Here’s a quick "Hello!" to Mrs D! Today, I’m passing past Figure 8 lake! I’ll make sure I take good pictures for you! Today we are heading out to the Stein Valley to hike with the Venturers from my group. We have 10 days of hiking planned and then a day of river rafting. It’s going to be a real challenge. The last time I did this hike was 14 years ago. It was tough then. Now that I’m 40…. Urgh, it’s gonna be tough. When Mrs D and I hiked this the last time, our camera batteries died on the first day :( We only got 3 pictures. This time, I’m bringing the 40D and 2 batteries. 2 x 4GB cards. I WILL make sure I get my pictures! Here’s our itinerary… I’ll be back online by the 29th at latest. 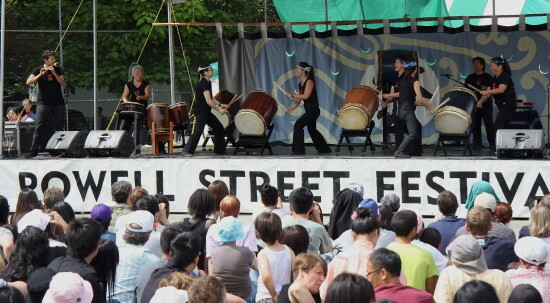 I went down to the Powell Street festival on Saturday to check it out. I’d never been, but my friend’s church participates actively, so I figured I’d head down and take some pictures. The weather was great and the entertainment was superb… It was a GREAT time. I’m going to try to find time to visit again next year!